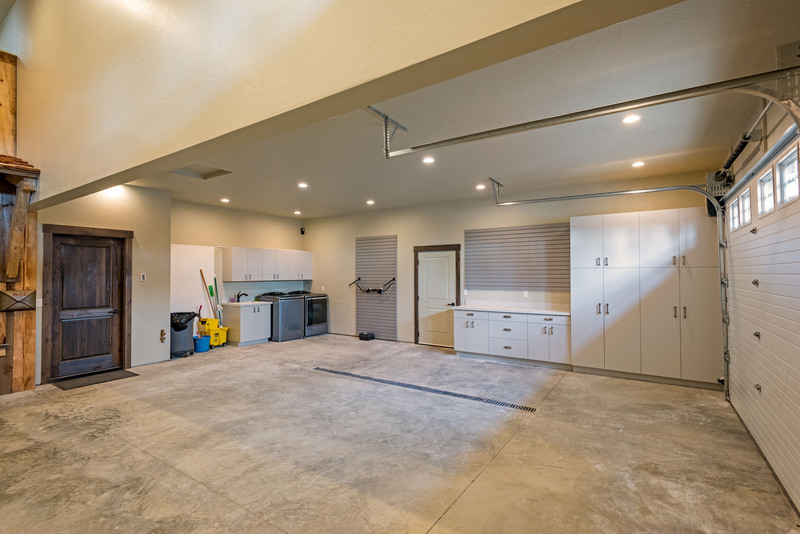 This 3,727sf residential shop serves many purposes for the homeowners. Though the word ‘shop’ is definitely not sufficient to describe a building with such beautiful design elements and so many different aspects. 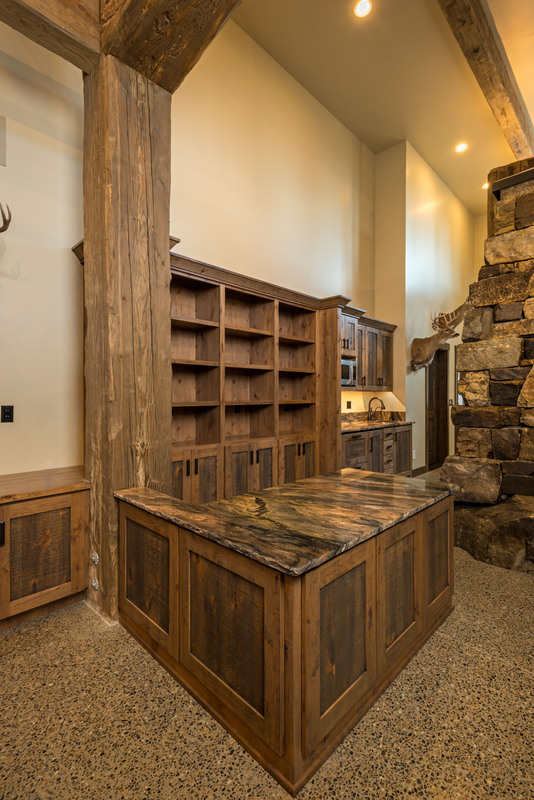 From the trophy room / man cave to the old-west tack room and even a guest apartment, every element has been meticulously executed for a beautifully finished shop… Out building? Maybe specialty residential annex? You decide! If you’ve lived in the Coeur d’Alene area long enough, you’ve likely seen these massive timbers in the water at the mouth of the Coeur d’Alene and Spokane Rivers. Historically used as the backbones of the log booms used to float smaller timber via waterways, these giants now grace this nearby shop, keeping Coeur d’Alene’s economic history local. A 10′ concrete retaining wall makes up one wall of this shop. To make the most of the situation, the homeowner requested a root cellar for her canning. Done! Buried into the hillside, Shelter integrated an 8’x 9′ concrete vault into the retaining wall and added shelving for all of her canned goods. It all started with a picture of a worn, rustic turquoise door. 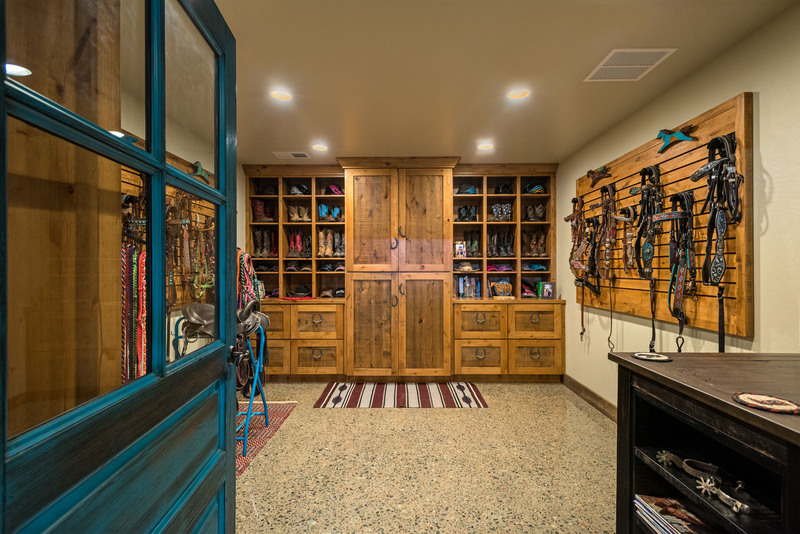 From there, the homeowner grew her vision for her dream tack room. 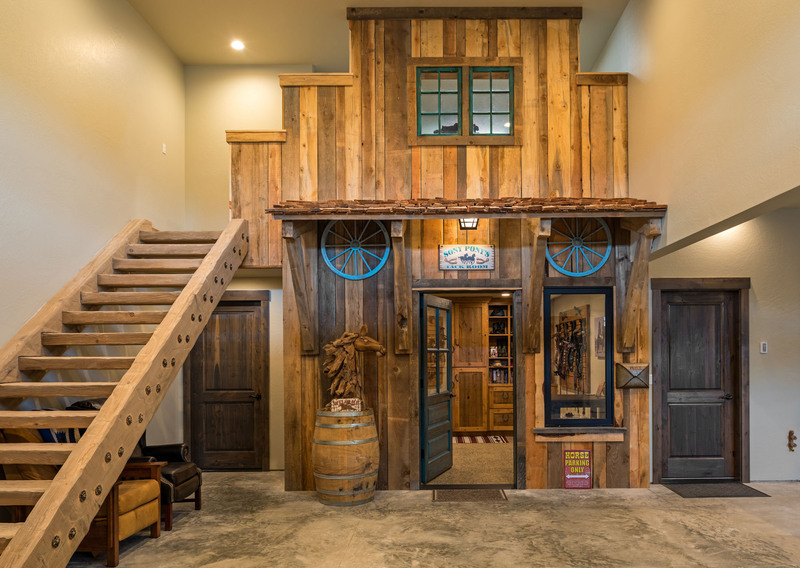 This old-west facade houses her tack room and a storage loft above. The owner of this shop made a trade with his neighbor to obtain these historic Coeur d’Alene timbers. Long-time residents would have seen these timbers floating in the lake for decades – left-overs from an era of logging via waterways – before they were eventually collected by this neighbor and finally stationed as guardians of this trophy room. 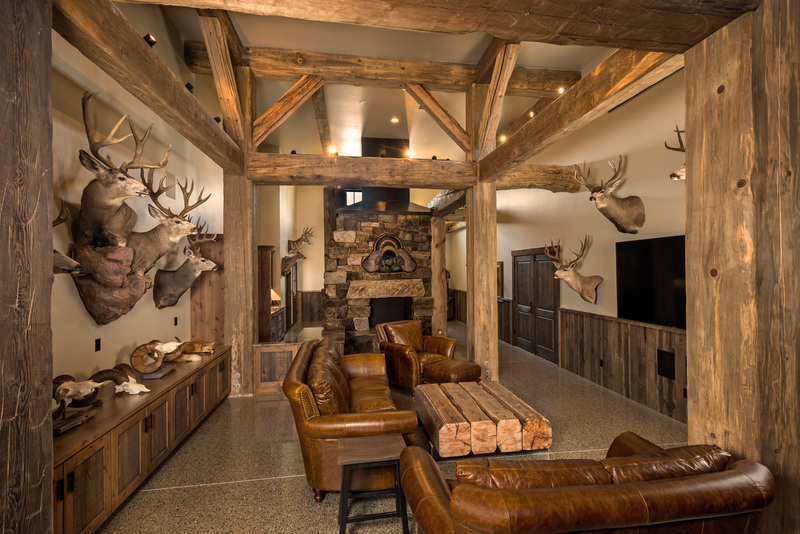 Along with hunting, both homeowners enjoy the sport of fly-fishing. As such, this seated-height island is intended to serve as a fly-tying station. We anticipate this counter will also serve to extend the hors d’oeuvre counter from the small kitchenette behind, as this is the perfect space for entertaining all the family and friends! The guest apartment serves a dual purpose as a craft room for the homeowner. 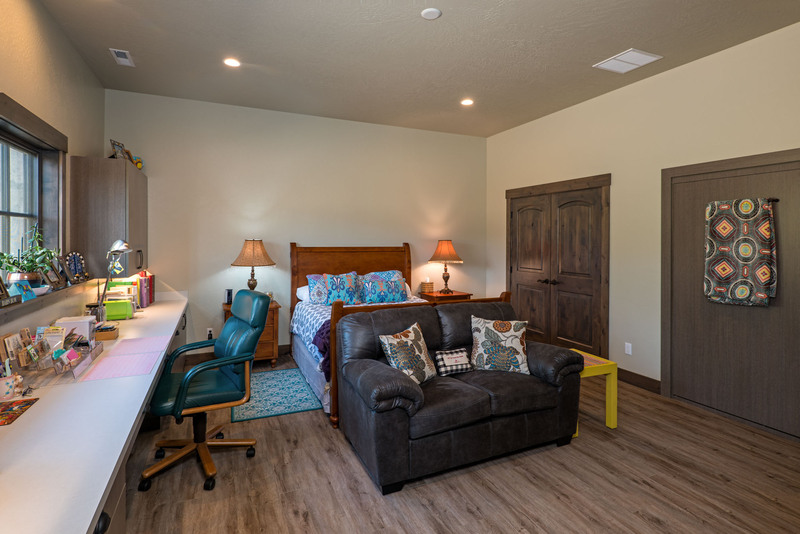 When guests are in town, however, the options are plentiful as a full-size murphy bed hides in the wall alongside the large closet. This apartment has its own back patio with views of the forest and busy local wildlife. Through the kitchenette sits this roomy 3/4 bathroom, which is dedicated to the apartment area of the building as the trophy room has its own half bath. 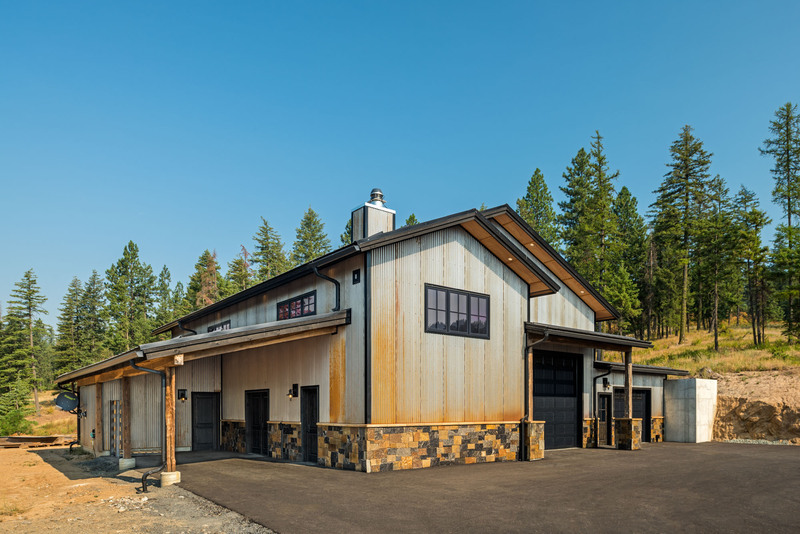 The character of the corrugated metal siding and colorful masonry allow this shop to stand on its own merit while the whispers of timber detail give a small hint of what hides inside. 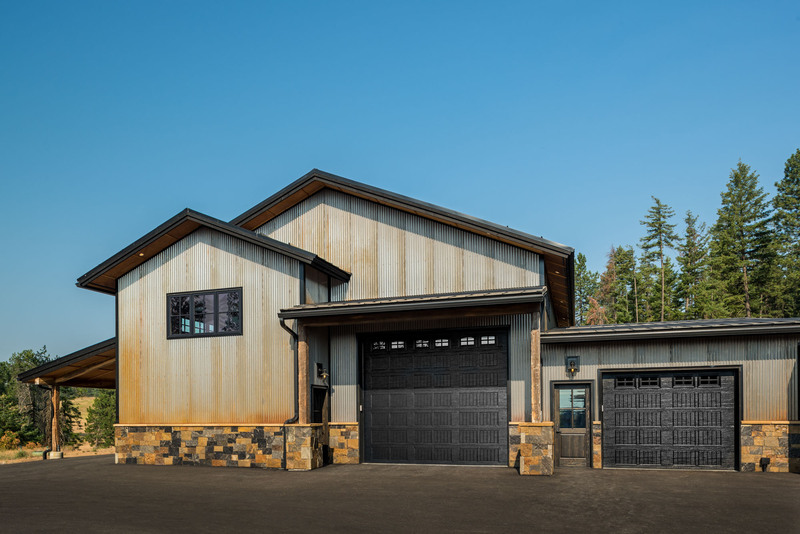 These fully insulated and weather-proofed overhead doors allow the entire building to be nicely climate controlled. Beautifully custom-crafted cabinetry with molded horseshoe pulls and custom wall storage allow this equestrian to stay neat and tidy! Seeded with fine bits of color, the finely polished floor is green mountain marble aggregate. 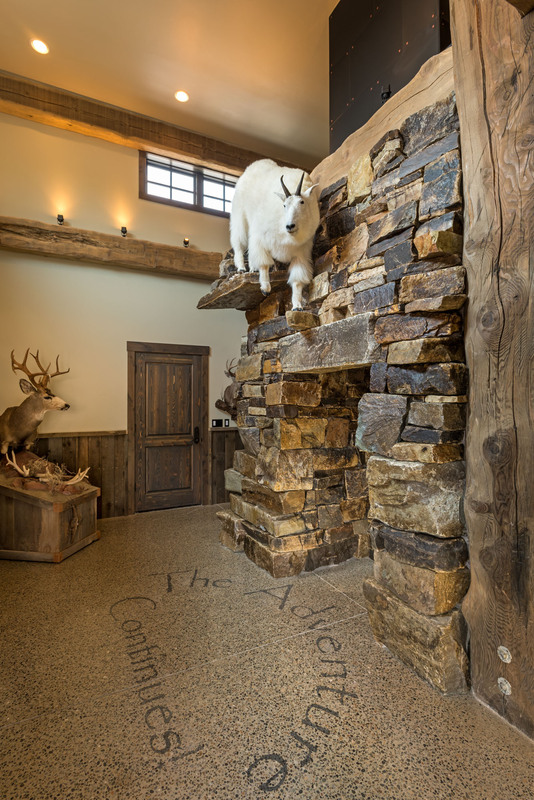 Integrating this mountain goat mount onto the back side of the great stone fireplace was only natural. 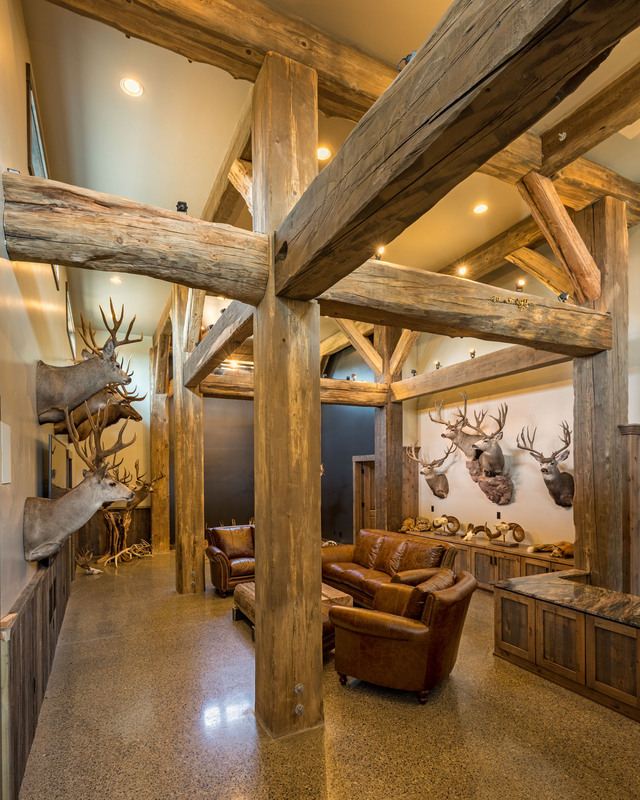 The goat balances over a large log storage area for the wood-burning fireplace in this foyer/entryway of the trophy room. The adventure will continue on! 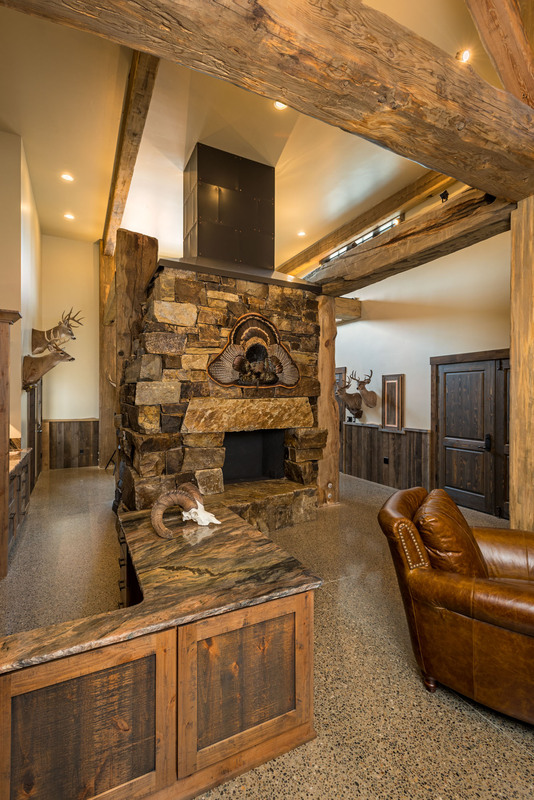 Partly hidden by the fly-tying counter in this photo, the massive stone hearth of this beautiful fireplace weighs in at 6500 lbs and was hand-picked out of a quarry in Clark Fork, ID by Matt Fisher and our mason on the project. 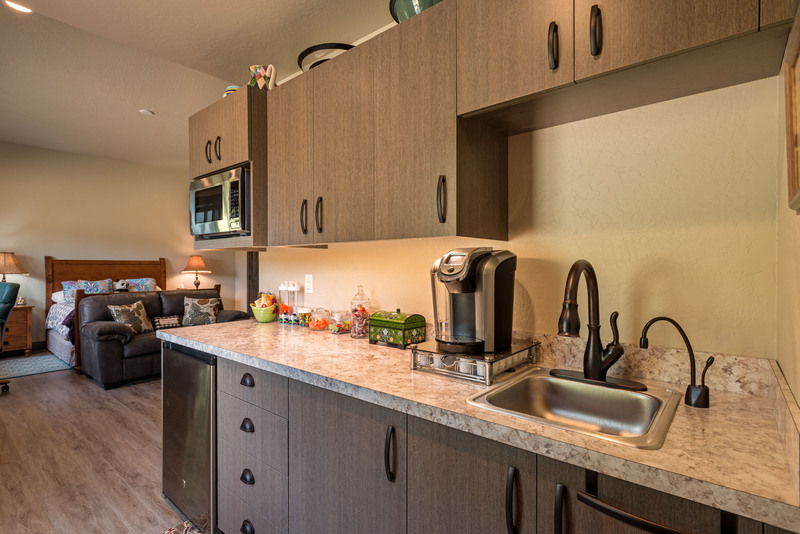 A nicely appointed kitchenette with dishwasher, hidden mini-fridge, microwave and instant hot water makes guests feel right at home. LVP flooring runs throughout the apartment with radiant floor heating to keep the toes warm and guests comfortable. As with most ‘shops’, extra parking is imperative. In-floor drains along with the radiant heating will allow snow and ice to melt off vehicles and be carried away. 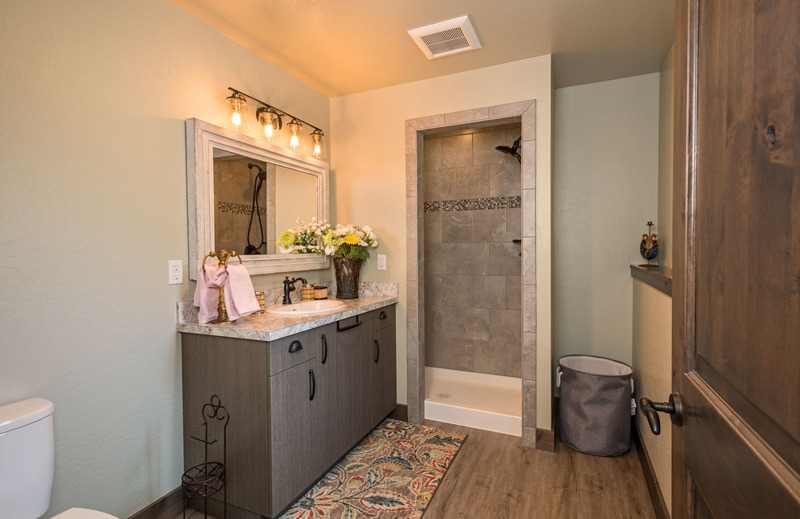 The utility area with a washer and dryer helps the horse-riding enthusiast keep her riding habit clean while also serving the guests in the apartment through the wood door.